Direct numerical solution of the highly nonlinear equations governing even the most simplified models of fluid-structure interaction requires that both the flow field and the domain shape be determined as part of the solution since neither is known a priori. To accomplish this, previous algorithms have decoupled the solid and fluid mechanics, solving for each separately and converging iteratively to a solution which satisfies both. 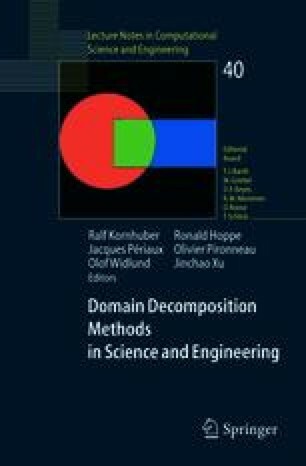 In this paper, we describe a nonconforming finite element method which solves the problem of interaction between a viscous incompressible fluid and a structure whose deformation defines the interface between the two simultaneously. A general methodology is described for the model 2D problem and the algorithm is validated computationally for a one-dimensional example.